Low temperatures, sleet and freezing rain caused the program organizers to cancel the opening ceremony for the event, but the conditions did not stop the volunteers who placed the more than 400 truckloads of wreaths that were transported from across the country by volunteer drivers using donated trucking and diesel. 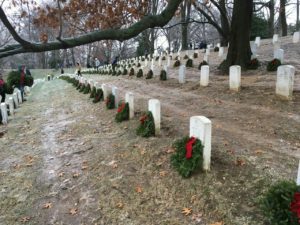 2016 marked the 25th year that wreaths have been placed by volunteers at Arlington National Cemetery. 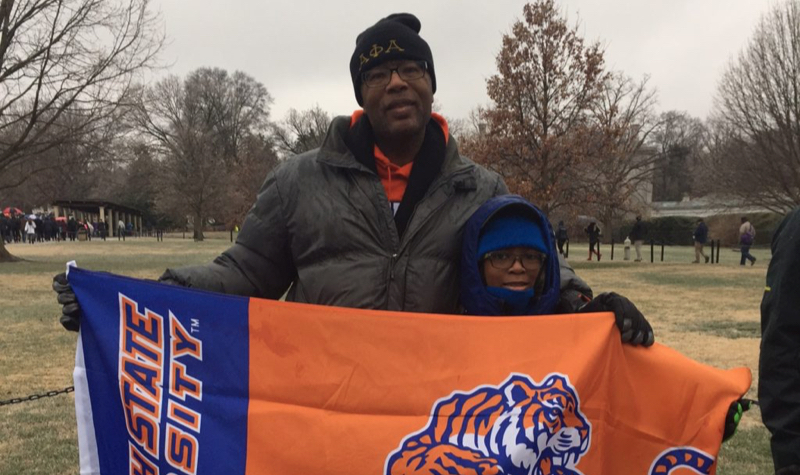 The program grew to be a nationwide event to honor and remember fallen veterans and their service. In 1992, Morrill Worcester, a wreath maker from Maine, had 5,000 extra wreaths, and decided to bring them to Arlington National Cemetery to honor fallen veterans. Worcester brought 5,000 wreaths to Arlington without any fanfare for 13 years, but in 2007 the not-for-profit organization, Wreaths Across America was formed. This year, according to Wreaths Across America, volunteers conducted wreath-laying ceremonies and placed 1.2 million remembrance wreaths at 1,228 veterans cemeteries and various other locations in all 50 states.